A patient recently came to SSE for a second opinion. She had a root canal on #21 just a month earlier by an endodontist. After the root canal, she continued to have pain and the root canal was retreated shortly thereafter. The patient was then sent to a periodontist who recommended extraction and placement of an implant. Aware of endodontic surgical options, her general dentist recommended she come for an additional evaluation. The patient was highly motivated to save her natural tooth. Our exam found #21 normal to percussion, normal probings and swelling on the buccal. An additional canal was suspected, so CBCT was taken for further review. CBCT clearly shows an additional lingual canal. CBCT mapping allowed us to determine where the canal would be located and confirm that it had its own apical foramen. With greater understanding of the canal anatomy, available only through 3D imaging, we recommended non-surgical retreatment to address the missed lingual canal. With the aid of the microscope, we were able to locate and treat the missed lingual canal. Because a canal was missed, retreatment (rather than apicoectomy) was the treatment recommended. Prognosis is good. Proper endodontic therapy will save this patient time and money. Fortunately, this patient's dentist suggested a second consultation for endodontic surgery rather than the extraction and implant placement. Endodontists are specialist is saving teeth. At the upcoming Inner Space Seminar on Friday, April 11th, 2014, Dr. Hessam Nowzari will present a balanced approach to the discussion regarding teeth and implants. What does the research show regarding the long term success of restored teeth and dental implants? 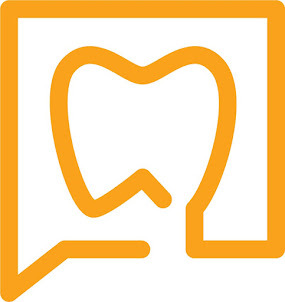 What effect does corporate marketing have on the dental educational system and dentistry as a whole? What is the quality of research that is being published in our dental journals and what effect does that have on our profession? How do we evaluate the quality of research to help us make important clinical decisions for our patients? What are the important considerations when deciding to retain a tooth or replace with an implant? As a periodontist, implant surgeon, former director of graduate periodontics at USC, and world renowned lecturer and researcher, he is uniquely qualified to lead this discussion in a responsible, scientific and unbiased manner. UPDATE: This morning we are inviting all of the participants of the seminar, to share their thoughts and impressions of the presentation throughout the presentation. Sometimes patients ask why they should save a tooth with a root canal and crown when they can just place an implant. A recent survey by Azarpazhooh et. al. demonstrated a declining pattern of preference for root canal therapy (RCT) in favor of implant supported crowns (ISC) among general dentists, periodontists, prosthodontists and oral surgeons as opposed to endodontists. This declining pattern showed a significantly higher preference for ISC over RCT retreatment. While dental implants are an important treatment option for our edentulous patients, implants, cannot replace the periodontium (tooth, ligament, gingival fibers, alveolar bone) that belong to the tooth. Extraction of a tooth removes the genotype which produces the phenotype that gives the tooth its characteristics. Most, if not all, of the long term challenges with implants such as crestal bone loss, loss of gingival architecture, occlusal trauma and perioimplantitis are due to the lack of periodontium. Can you remember that dental embryology class? Remember the endoderm, ectoderm and mesoderm? While you may not have thought about these tissues for many years, understanding the difference between teeth and implants goes back to that first semester of dental school. All human tissues form from one of these three embryonic tissue layers (endoderm, mesoderm, ectoderm). The tooth is formed from ectodermal tissue and it's close developmental association with the mesenchymal (mesodermal) tissue. The tooth bud is an invagination of the ectodermal tissue into the mesodermal tissue. Neural crest cells (ectodermal cells) that blend with the mesodermal cells are called ectomesenchymal cells. The interaction of the ectoderm and ectomesenchymal cells form the enamel organ which forms the tooth. So as the tooth develops through the bud, cap, bell stages, the enamel organ will form the enamel, the dental papilla will form the dentin and pulp tissue and the dental sac will form all the supporting structures. These supporting structures (periodontium) include cementum, periodontal ligament and alveolar bone. The alveolar bone, including the lamina dura are derived from osteoblasts formed from ectomesenchymal cells. gingiva, ligament, alveolar bone) of ectodermal origin. Once the tooth is lost, these tissues are irreplaceable. So the tooth, and its supporting structures are derived from ectodermal tissue and ectomesenchymal tissue. In other words, the periodontium BELONGS to the tooth. So why does this matter? It matters because when a tooth is extracted, the periodontium is lost. The periodontium is what makes a tooth look, function and feel like a tooth. The maxillary or mandibular bone is derived from mesodermal tissue. When the dental implant is placed into the jaw bone, it is placed into bone derived from the mesodermal tissue. That bone has different quality and function from the bone associated with the periodontium. That is why the dental implant does not feel, look or function "just like a tooth". They are not the same. This important point should not be forgotten. 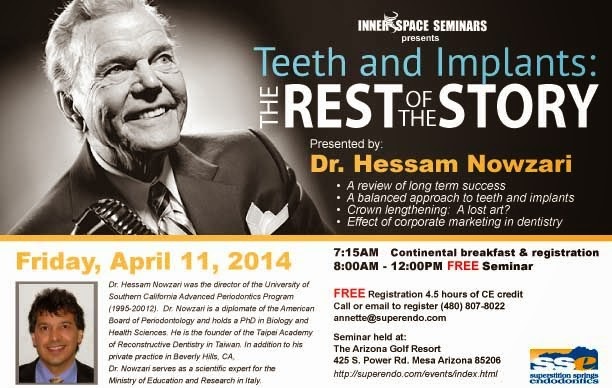 Come and learn more about teeth and implants at our upcoming Inner Space Seminar - This Friday, April 11th, 2014 - featuring Dr. Hessam Nowzari.